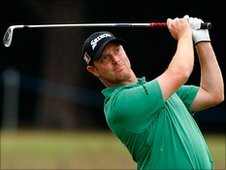 Essex golfer Richard McEvoy has qualified for his first major after reaching next month's Open Championship at Sandwich. He finished in the top 10 of the international qualifier at Sunningdale on seven under par. McEvoy, from Shoeburyness, said: "I was fairly nervous, I knew I was in with a chance after a good morning round. "I had to put in a good performance in the afternoon, I was playing steadily and then made an eagle at 14." McEvoy qualified for the Open at the 11th attempt after going into the qualifying event off the back of a strong showing at the Wales Open last week. The last time the major was held at Sandwich in 2003, outsider Ben Curtis triumphed. And McEvoy says that gives him hope: "It just shows anyone can do it, if they have a good week at the right time. "It gives me the belief and the will to go and do well at the Open."